"Pasembur is a Malaysian Indian salad consisting of cucumber (shredded), potatoes, beancurd, turnip, bean sprouts, prawn fritters, spicy fried crab, fried octopus or other seafoods and served with a sweet and spicy nut sauce. The term Pasembur is peculiar to Northern Peninsular Malaysia. It is especially associated with Penang where Pasembur can be had along Gurney Drive. 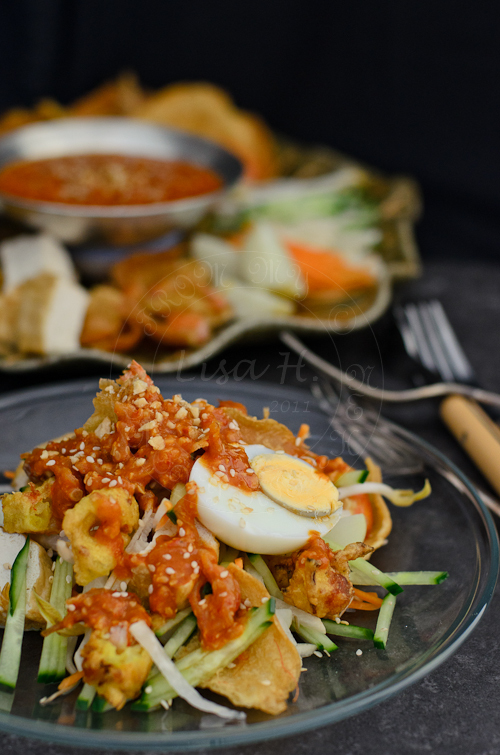 In other parts of Malaysia, the term Rojak Mamak is commonly used." Its been many years..since I last had a plate of Pasembur... the last time I had a plate full of this glorious gorgeous Pasembur was most probably back in 2008, visiting my parents and before my dad's health dwindled. I was a school going kid who lived miles away from school, and had to rely on our super efficient (NOT!!) public transport. I reached home from school almost 2.30 pm everyday. ... feeling tired, sweaty, hot and bothered...Plus it was quite a walk from the bus stop to home... everything seems far in the hot weather plus when one was tired from half day using one's brain power and the heavy bag pack!!! Shower and a change into fresh clean clothes can wait... but my tummy, couldn't!! ...so its "too BAD... tough Luck" for me if I was to attend the afternoon session school... wilted and soggy Pasembur would be waiting and greet me from under the food cover ... if any left at all!!! Heat oil in a wok until nearly smoking. Using a tablespoon, scoop the batter and drop into the hot oil. Dish out the golden nuggets onto the absorbent kitchen paper. Mix the blended chillies and sweet potatoes in a medium size saucepan. Bring to boil then simmer on medium heat for 20 minutes. Add the rest of the ingredients until the sauce thickens. Prepare, julienne and cut into bite size as per photo above. Divide into individual plates. Drizzle the sauce on top. Note ~ * water - add 1/2 cup water if it is too thick and unable to move the blender blade. it's taste sometimes bitter if hangit. but the gravy i normally lve both. eitehr teh nutty one or the sambal one. Chek lapaq la nengok pasemboq hang ni. Wow!! !what a wonderful Rojak, yummmy!!!! This is a new salad to me．　Looks exotic and delicious! Hi Lisa! We call this "Indian Rojak" here in Singapore... The hot, sweet and spicy peanut gravy is the soul of the dish.. oh.. I love the fresh green chili too! Ooh....rojak is one of my favorites. Now hardly buy from outside. And now looking at yours, it is good and always healthy to make at home. Yum. fresh sengkuang kat sini seasonal... kalau ada pun, mak aiii , mahai, about AUD$15/kg!! How did you manage to get the sengkuang? Haiyo my goodness! I felt like having pasembur...and you have it here!!! Kalau balik Perlis, mesti makan pasembur di pekan Kodiang, Kedah. Memang tak boleh lepaskan peluang.